A while back I saw this amazing 13 images panorama of the Milky Way featured as the photo of the day for NASA’s astronomy site. I was fascinated with it and asked Mike Salway if he can share how he took it with DIYP readers. Early in 2012, I was fortunate enough to win 1st prize in the Ken Duncan Photo Awards competition. The prize was a 2 week photographic tour with Ken to the Kimberley region of North West Australia, to photograph some of Australia’s most remote and yet iconic landscapes such as Cape Leveque, Mitchell Falls and the Bungle Bungles. 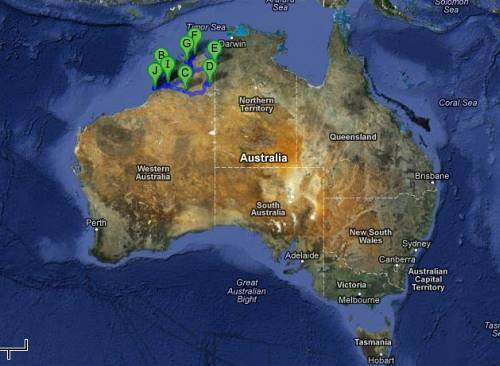 The Kimberley Region of North West Australia. We covered over 3,500 km during the trip. One of my passions in photography is Nightscapes – night sky scenes combined with beautiful foregrounds. I saw this trip as a great opportunity to capture some unique nightscapes amongst some of the darkest skies in the country. I prepared for the trip by buying a Samyang 14mm f/2.8 lens – a nice and fast ultra-widefield lens for my Canon 5D Mk II. It’s manual focus and manual aperture setting, but for nightscapes that’s not a problem. To focus at night, I simply switch to Live View on the 5D Mk 2, find a bright star and zoom right in, and toggle back and forwards through the focus until the stars are as tight points as they can be. 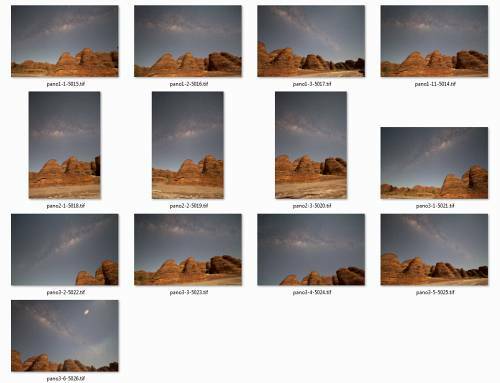 Aperture setting is always at f/2.8 (or as fast as your lens allows) and ISO is always high for nightscape shooting. I use ISO3200 on the 5D Mk II. 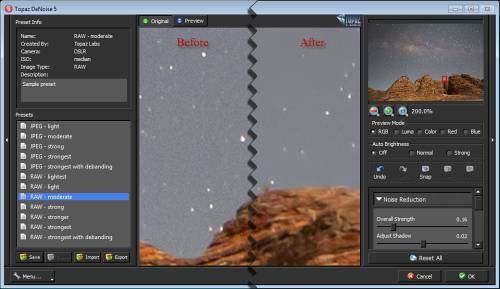 You want to collect as much light as possible in the shortest time possible, so you can capture your scene before you get trailing of stars due to the Earth’s rotation. For an ultra-widefield lens like the 14mm on a full-frame body, you can capture up to 30s exposures without any trailing of stars. Any longer than that, and the stars won’t be pin points anymore when you zoom right in on your preview screen after taking the shot. For a longer focal length, the exposure time would have to be shorter before you get trailing of stars. There’s always a little distortion around the corners on the wide open lens, and always a bit of grain shooting at high ISO, but for nightscapes you can sacrifice that bit of sharpness in the corners for capturing more light. And for noise reduction, there’s some great Photoshop plugins and other tools that do an excellent job cleaning up those high ISO images. The only time you’d stop the lens down or use a lower ISO, is if you’re purposely going for longer exposures to do a star trails image. 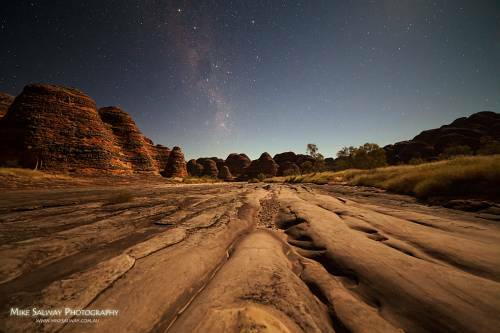 In that case, you might stop down to f/8 with a lower ISO like 200 or 400, and capture exposures of several minutes at a time, like I did for these images of Star Trails at the Bungle Bungles and Moonlit Mitchell Falls Star Trails. We had visited the Bungle Bungles for a sunrise shoot earlier in the day, and I asked our guide if she could take me back at night. It was about a 40 minute drive from our camp, and this was after she had worked all day, so I was ecstatic when she agreed. 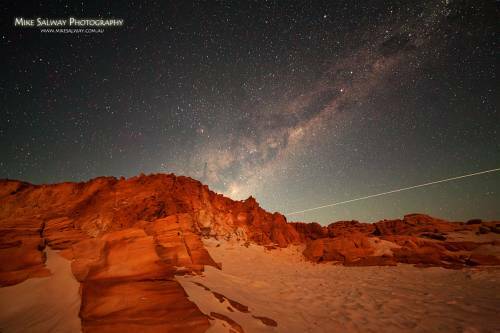 I had showed some others in our group the nightscapes I’d captured at Cape Leveque a few days earlier, and they were keen to learn how to do it so 8 of us boarded the truck after dinner and headed back out to the Bungle Bungles. Compose your shot. Look for an interesting combination of foreground and sky. It might be difficult to see the scene properly through the viewfinder at night, so take some test exposures to check your composition and focus. Use a cable release or intervalometer if you have one, and fire away. 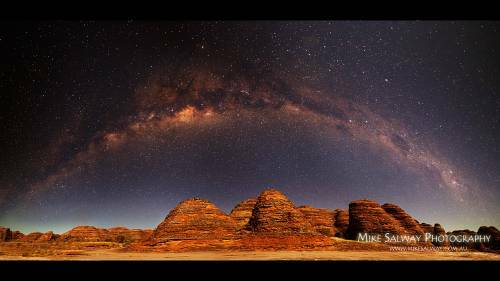 We were fortunate that a crescent Moon high in the West provided the light we needed to light up our foreground – the beehive domes of the Bungle Bungles, and it was a perfect time of year with the Milky Way having just risen in the East. 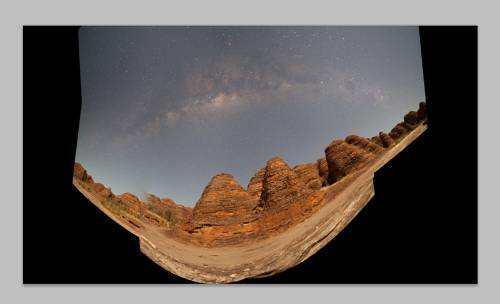 While the rest of the group was happily snapping away, absolutely thrilled with what they could see on the preview screen, I started composing my shots and was keen to capture a panorama showing the extent of the Milky Way over the Bungle Bungles. I usually try to shoot my panoramas in vertical orientation most of the time, and allow at least 1/3 to 1/2 the frame overlap. It’s always best to shoot more than you need, as there’s nothing worse than having gaps in your mosaic and having to throw away a potentially great image. You want enough around the edges to be able to crop and warp later. For this image, I originally thought 5 or 6 frames would cover it and captured some in landscape orientation, but when I stitched those together it was horrible – nowhere near enough coverage. Luckily though, I was able to use images from the same time that I didn’t originally plan for the mosaic. Auto Pano Pro was clever enough to take all of my frames and make something of them. So in the end I captured 13 panels, all with the same settings – ISO3200, 30s exposures, f/2.8, 14mm. The screenshot above shows the single images I captured, pretty much straight out of the camera and exported from LR as TIF. I import my images into Lightroom for categorisation, ranking and initial post-processing. Usually that’s a little noise reduction, saturation boost and applying the lens profile for the Samyang 14mm to remove some of the distortion. I then export the 13 panels as full-size TIF’s. I use AutoPano Pro for stitching my panoramas – it’s a great piece of software, really easy to use, handles all of my panoramas seamlessly and is good value at only 99 Euros. I use default settings with cylindrical projection in most cases. 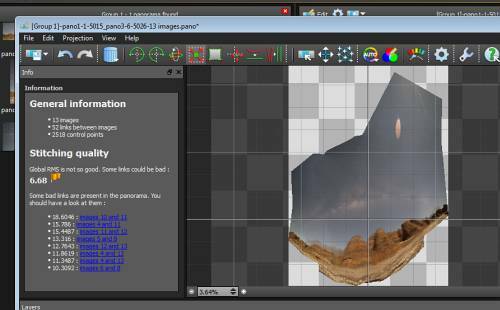 I save the panorama as a 16-bit TIF, which I then import back into Lightroom or Photoshop. The initial panorama creation in AutoPano Pro. You can see it really needs some work! I use Topaz DeNoise photoshop plugin, with the RAW medium or RAW light setting depending on the image. I find it does a great job at reducing the noise of high ISO shots while still retaining star and foreground detail. I simply apply the noise reduction to the background layer. 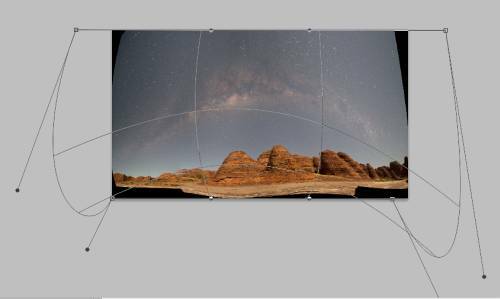 In most cases, the panorama will come out distorted and unless you crop out huge amounts of your photo, you need to apply some warping to get the horizon straight. Because of the wide field of view, this will result in the milky way being curved like a rainbow across the sky. After increasing the canvas size and doing an initial crop, I duplicate the background layer, and use Edit->Transform->Warp, grab the edges and pull them in the directions needed to get the photo how I want it. The warp tool is a life saver! I can then crop any remaining parts away to get the panorama ratio I’m after, and use the clone tool to fill in any minor gaps around the edges. The camera captures a lot of detail in the sky but requires some post-processing to give it more contrast and make it pop. I do this by small increments of levels and curves layers, paying careful attention not to clip too much off the black end or white end. The Milky Way can stand up to generous amounts of saturation or vibrance layers, in small increments. You want the yellows, oranges and reds of the central bulge of the milky way to stand out more, but without introducing colour noise or blotchiness. Finally some colour balance adjustments to get the sky background to a pleasing neutral colour and to correct any colour cast such as reds or yellows or blues that may have been introduced by the bright Moon or by any of your other adjustments. Your aim is that the sky looks fairly natural and not overly processed. With all these adjustments for the sky, the foreground can end up too contrasty or with too much orange or yellow – especially with the bright Moon lighting up the foreground and the already natural yellow/orange colour in the beehive domes. So I duplicate the base warped layer and use a layer mask to reveal just the foreground. I then applied any levels, curves and saturation adjustments as clipping masks just to that foreground layer to ensure it looks as natural as possible, while revealing the detail you’re after. I save the whole layered image as a PSD, and then flatten the layers to do some sharpening and resize to around 1200px wide with a final smart sharpen for web presentation. And that’s all there is to it! The combination of beautiful dark skies, a stunning location and foreground scene, the right camera and lens combination and the right settings – the rest is fairly straight forward and it’s something that everyone can achieve. Mike Salway is a passionate amateur astronomer and photographer based in Central Coast of NSW, Australia. You can follow his amazing work on his blog and Facebook page. « How Good Is Your Hue Sight? As a photographer who loves to capture the night sky, the thing I was most impressed with here was your ability to use the Warp tool with such precision.